"It was such a pleasure to sink one's hands into the warm earth, to feel at one's fingertips the possibilities of the new season." - Kate Morton, "The Forgotten Garden"
March is exiting like a lion, and April is arriving with beautiful spring weather. Join Greenhouse Garden Center, David and Julie Ruf, and all the staff as we celebrate 42 years in business at this same location. This month is chock full of sales, promotions, and great classes. Don't miss our 42nd Anniversary Sale on April 16-17 from 9 AM to 5:30 PM, both Saturday and Sunday. Everything in-stock nursery-wide (with the exclusion of bulk soils, bulk rocks and sod) will be on sale and, best of all, you will be able to use your Rewards program. If you have not already signed up for our Rewards program, now is the time to do so. By signing up for Rewards, you save 5 % on every $100 spent here at Greenhouse Garden Center. This month we are also hosting Aaron and Paula Penrod, owners of the local SYN Lawn store, who will be talking about artificial turf on April 9th at 11:30 AM. If you have been thinking about installing artificial turf, this is a definite don't-miss seminar. Find out about all the different types of artificial turf available. Greenhouse Garden Center Landscape Division is ready to handle the installation for you. At the end of the month, on April 30th, Thomas Chaplin of Fox Farms Soil and Fertilizer Company will be joining David at the 10 AM seminar, "Gardening Naturally With Organics". Earth Day is April 22nd, and we are ready for the Annual Paydirt Sale. This is your day to stock up on purple and orange Paydirt for the year. On this day only, you can purchase unlimited quantities at $7 per bag. That is a savings of $4 per bag! Finally, Arbor Day is April 29th. All trees will be on sale; limited to stock on hand. Seminar, “Gardening Naturally With Organics”, Speaker: David Ruf, Guest Speaker: Thomas Chaplin of Fox Farms, 10 AM. A unique blend of chicken manure, redwood sawdust, peat moss and mushroom compost. Adds organic matter to the soil. It helps loosen hard soils, improves water and root penetration and enhances the bacterial action in the soil. 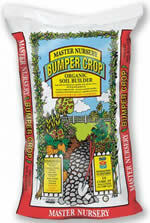 Mix into the soil prior to planting flowers, vegetables and shrubs or use as a top dressing for newly seeded lawns. Multi-purpose soil conditioner for flowers, vegetables, shrubs, trees, perennials and new lawns. Formulated to help loosen compact soils, improve soil aeration and retain soil moisture. May also be used as a mulch in planting beds or as a top dressing for newly seeded lawns. Contains: Fir Bark, Aged Redwood, Chicken Manure, Earthworm Castings, Pumice Stone, Bat Guano, Feather Meal and Kelp Meal. Also contains Mycorrhizae and Humic Acids. Potatoes are one of the first food crops you can plant in spring. Like peas, spinach, and onions, they are planted as soon as the ground is dry enough to dig. If your garden is slow to thaw, don't worry. As long as you get the crop planted four weeks before your last frost, it should do well. Typically, the last frost date will be around the end of May. The varieties are grouped by "Maturity" days, which are the number of days from planting to harvest, on average. Each potato tuber is a complete package, containing enough water and nutrients to get the plant off to a good start. It just needs well-drained soil and full sun. In temperate climates, irrigation isn't an issue; for many farmers and gardeners, potatoes are dry-land crops. One to two inches of water per month between planting and harvest is enough to produce a crop. We guarantee that all the potatoes here at Greenhouse Garden Center are certified seed potatoes. This guarantees that they are disease-free. The listed varieties are all available here. If you are thinking about synthetic grass, you are thinking about water conservation, less maintenance or work, more leisure time, and a product that is environmentally friendly. SYNLawn of Northern Nevada, locally owned and operated, is pleased to have our synthetic turf available at Greenhouse Garden Center. SYNLawn Synthetic Turf is the first and only synthetic turf company to be recognized by the USDA as Biobased Certified. SYNLawn replaces 60 percent of petroleum used in polyurethane with soybean oil - utilizing a rapidly renewable resource, making SYNLawn products 100 percent recyclable. SYNLawn has also partnered with the Yellowstone Project, purchasing empty plastic drink bottles from the National Parks Service to be recycled into product backing. With over 40 years of experience, SYNLawn is the largest manufacturer and installer of synthetic landscape grasses and putting greens in North America. SYNLawn is completely manufactured in the USA, including raw materials, ensuring the quality of products used in the manufacturing of our turf. SYNLawn has a 15 year manufacturer-backed warranty. SYNLawn has developed a thatch zone which does not require rubber or silica sand infill to hold the bladed of the grass up. HeatBlock technology offered on select grasses lowers grass temperatures up to 20 percent, and cools off faster than gravel, rock or DG, which makes it more child, pet and plant friendly. All-natural pet deodorizing material is used, which offers the cleanest and safest environment for children and pets. SYNLawn saves water, money, time and frees you up to enjoy life. Join Aaron and Paula Penrod, owners/distributors of SYNLawn, for a free seminar, "Artificial Turf With SYNLawn", Saturday, April 9th, here at Greenhouse Garden Center. This lovely small tree, 25-30 feet tall, is a yellow deciduous magnolia variety. With adjectives like big, beautiful, mid- to late-season blooming, fragrant, showy, yellow flowers - you can't go wrong. Plant this beauty where the flowers can be enjoyed up close. Magnolias require afternoon shade. This variety is very cold-hardy, USDA zones 4-8. Best of all, it's deer resistant. We just received a shipment, and they are ready to be planted. The gift shop just received a wonderful selection of pictures representing Mother Nature at her best. Pillows are a great way to create a fresh, seasonal look. Change them out on your sofa, add an accent to a favorite chair, or dress-up the guest room. Hydrofarm's Desktop Plant Light offers illumination and versatility for indoor growing. The lamp has a flexible neck and adjustable height with a stable base to provide clean and balanced light that works for seed starting, small potted plants or even as a reading lamp. No matter the use, Hydrofarm's Desktop Plant Light provides energy efficient, flicker-free performance that will be good for your plants for years to come. This plant light is also available as a floor model. Water everything in the yard at least twice a week this month. We are experiencing a beautiful, early, warm spring this year. Even if we get some April showers, we will need the additional water, since plant material is so far along. Aerate the lawn now and apply a Topdressing, such as Paydirt, Gypsum, and Master Green Lawn Fertilizer or EB Organics Natural Green Lawn Food for spectacular results. Mulch around all your plants with Black Forest Compost to retain moisture. Just a 3" layer can save 20-30 gallons of water a day. Always water between midnight and noon - never between noon and midnight - to prevent lawn and plant fungus disease. Fertilize the lawn, vegetables, trees and shrubs. Greenhouse Garden Center carries many product options, organic and manufactured. Spray your apple and pear trees with Captain Jack's Deadbug Brew or Bonide Fruit Tree Spray after your trees have dropped 80% of their blossoms, so you are not harming the pollinators (aka bees). Spray one time a week for 3 weeks. Coddling Moth Traps may be rehung after that and will serve as an indicator for coddling moth activity later in the season. Coddling moths may go through 4-6 life cycles in 1 season. Wall O' Waters need to go up. Plant tomatoes and peppers one week later, after the soil temperature has warmed up inside the Wall O' Water. They'll be the earliest and biggest in the neighborhood. Spray Florel on Crabapple and Hawthorne trees to prevent unwanted fruit. To be effective, spray 1 time a week for 3 weeks. Bonide Tree And Shrub Insect Control needs to be applied now to trees and shrubs (including roses) for best results. Imidacloprid (the active ingredient) is an annual soil drench used systemically to prevent unwanted insects, including borers. It is now available in a formulation that is safe to use on all fruit trees. To protect pollinators (aka bees), wait until the blossoms have dropped on all flowers trees before applying this product. Prune your junipers and arborvitae now so any "holes" will fill in during the summer. When pruning roses, be sure to seal cuts larger then a pencil eraser with a pruning sealer to prevent cane borers. Use Pond Shade when the temperature in your pond reaches an average temperature of 50 degrees to prevent algae and blanket weed from forming. Cut the tops off of each bell pepper. Remove any seeds and stems from the inside. Dice the tops of you removed. In a large bowl, combine the raw ground beef, tomato sauce, onion, rice, diced bell pepper tops and 1/2 cup of the cheese. Stir to combine with a spatula. Stuff each pepper with the ground beef mixture. Fill crock pot with one inch of water. Cover with lid and cook on Low heat for 6 hours OR on High for 4 hours. Top each stuffed pepper with the remaining shredded cheese. Cover with lid until cheese has melted.